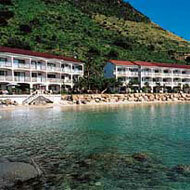 St. Martin - This hotel rests on two beaches on the French side of the island. Grand Case Beach Club is a short stroll from the village of Grand Case and a 20 minute drive from Marigot, a quaint seaside village. Snorkeling, sailing, tennis, dining and shopping in town will fill your days and provide warm memories of a wonderful Caribbean vacation. 68 air-conditioned rooms. The Grand Case Beach Club offers low rise apartments and townhouses with a warm relaxed atmosphere, decorated in colors reflective of the local culture. Five 2 and 3-story buildings are separated from the sand by a colorful garden of bougainvillea. Each unit has a fully equipped kitchen, guests receive complimentary continental breakfast daily and a complimentary bottle of wine. From each room it is only a couple of steps down to the beach area. Beach: There are two beaches, and guests have complimentary use of chaise lounges and towels. The Grand Case Beach Club sits at the end of a white-sand beach, just steps away from the quaint village of Grand Case, on the northwest coast of French St Martin.